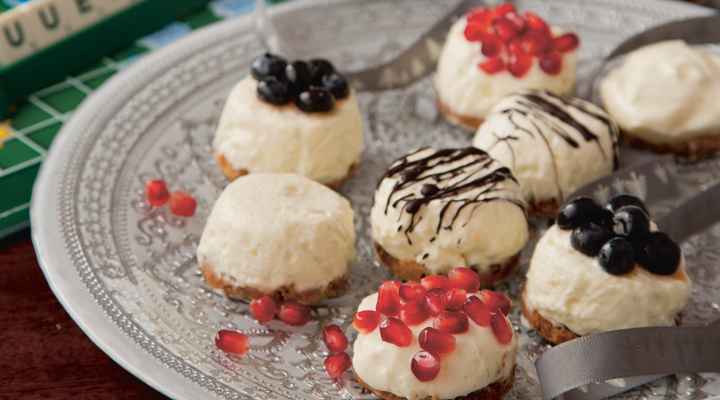 These no-bake mini desserts are an ideal recipe to make with kids. You can posh them up too with pomegranate seeds, fresh blueberries or a drizzle of melted chocolate for an extra touch of luxury. Beat together the cream cheese, icing sugar and the lemon zest and juice. In a separate bowl, whip the cream to soft peaks, then fold into the cream cheese mixture. Line a 12-cup muffin tin with cling film and divide the cheesecake mixture between the cups. Give the tray a couple of bangs on the counter to get rid of air bubbles, then top each cup with a biscuit. Make sure you choose a crunchy biscuit that sits snugly into the muffin tin holes. Chill in the fridge for at least 1 hour before turning out and serving on a platter.